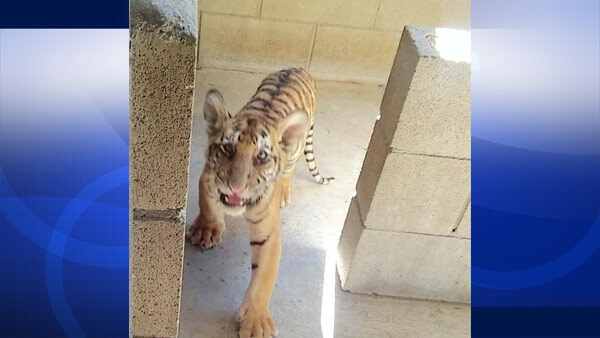 A baby tiger was dropped off by an anonymous woman at a San Jacinto animal shelter on Thursday, Sept. 3, 2015. SAN JACINTO, Calif. -- A San Jacinto animal shelter accepts all kinds of animals, but shelter workers got a big surprise Thursday when a woman dropped off a baby tiger. The woman would not say where she obtained the 3-month-old male cat, but the Ramona Humane Society agreed to take in the exotic kitty. The shelter contacted the California Department of Fish and Wildlife and an agent went to check on the animal, which appeared to be in good health. The tiger has now been transferred to the Forever Wild Exotic Animal Sanctuary in Phelan.